Dusk from the train from Mumbai to Hospet. Once again adventure found us. 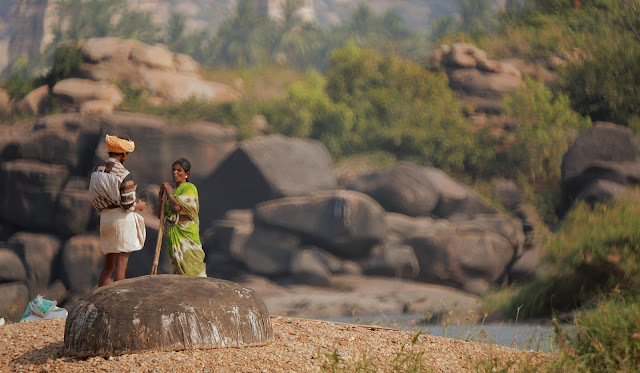 We knew ahead of time that our hotel was across the river from Hampi Bazaar. And that the boats that ferry people across the river stop at 5:30pm. And that we'd be arriving after that. Which left the only option (we thought) to take a car or auto-rickshaw the long way around. However, when we arrived in Hospet, the rickshaw driver said he had a friend who could take us across the river. Sure, we thought. It'll be quicker and cheaper. 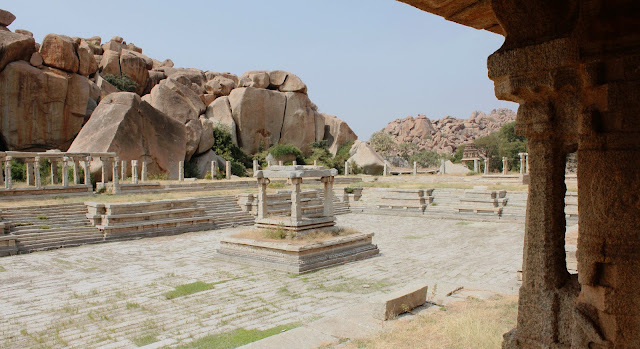 When we arrived at the Hampi, we were told to be quiet as we walked down the pitch black stairs to the river bank. There we met a Austrian couple with their daughter attempting to cross the river as well. The boat turned out to be a round woven basket called a coracle. We hadn't realized how illegal crossing a river would be. I do think they played up the secret-mission feeling to up their price. Anyway, we made it across with wet butts but aside from that, we were fine. Luckily the Austrians were staying at the same hotel and we followed them there in the darkness. The north side of the river, Virupapur Gaddi, more commonly referred to as Hampi Island. The view from our hut, looking out on rice paddies and palm trees. 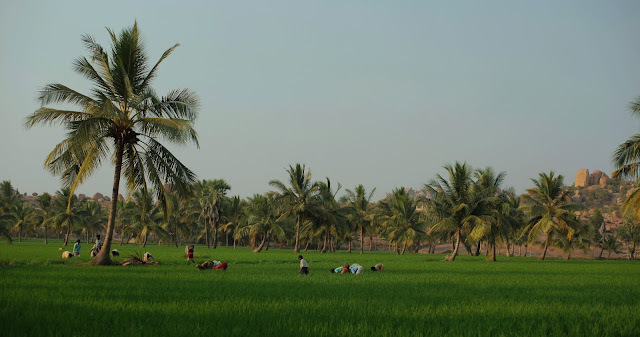 Working in the rice paddies. 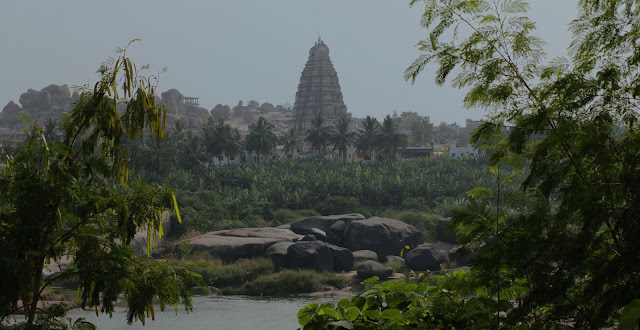 Vikupaksha Temple from across the river. Fishing on the river in a coracle. A man baths in the Tungabhadra River. Langur monkeys crossing a rice paddy. The remains of Bukka's Aquaduct. A Macaque grooms his Langur buddy. 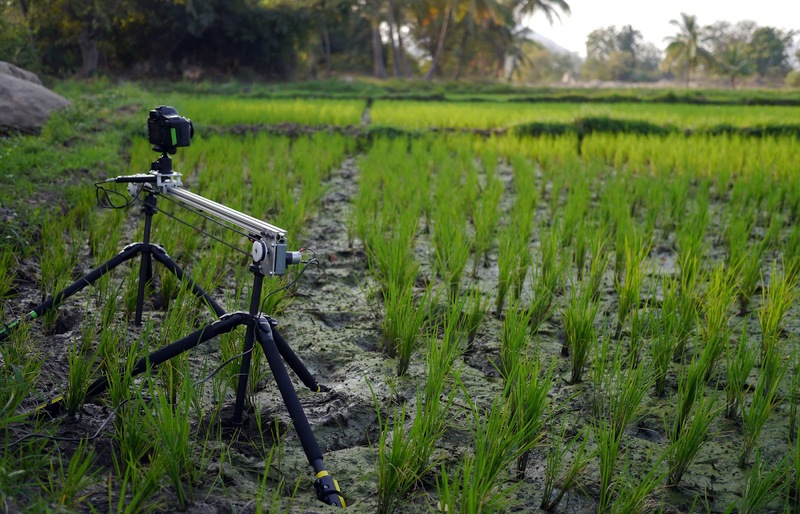 Time lapsing in the rice paddies. 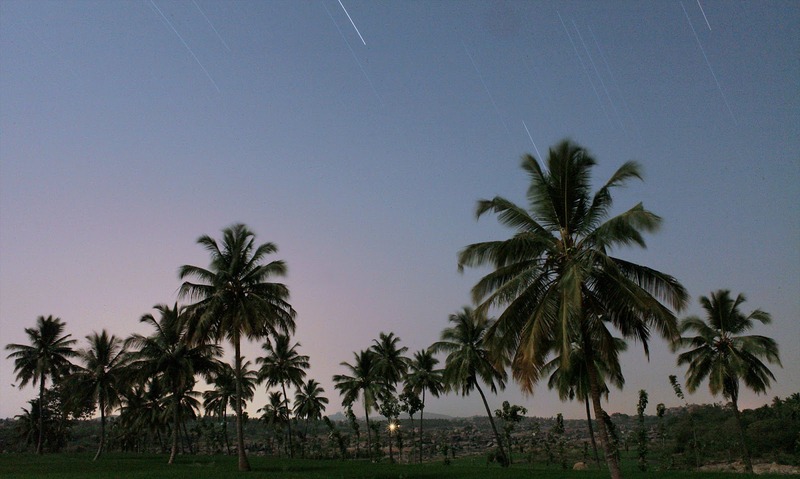 Hampi has a sleepy beach town feeling, which is odd considering it's hours from an ocean. The main tourists here are mostly European, dreadlocked, rented-moped mounted, hippies. Considering drugs and alcohol are both prohibited, that is also odd. Hampi has a surreal landscape, covered with massive boulders, rice paddies and interspersed ancient temples and ruins. 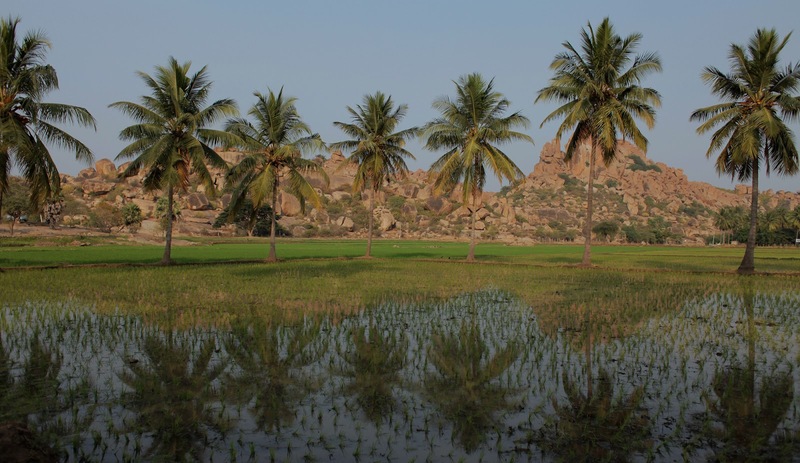 We roamed around for a few days, wandering through the paddies, over boulders and across streams, which was nice way to avoid the aforementioned hippies. Courtesan's Street leading to Achyutaraya's Temple. Pilgrims walk among the ruins. Caution sign near the river. Stone pillars are all that remain of the old bridge. 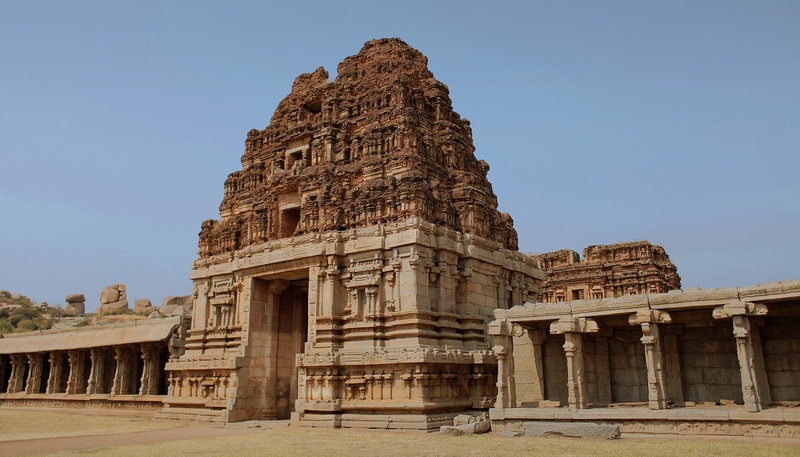 Vikupaksha Temple in Hampi Bazaar.